The shedding of the fluffy undercoat is also known as molting or blowing coat. As the new top coat comes out, the under coat is pushed out and deposited whereever the Husky goes. This will be in your yard, on the floor, on furniture, and on your hand if you stroke your Husky during molting season. Typically your Husky will shed twice a year, once between September and February, then again between March and August. However this isn’t a hard-and-fast rule. Some Huskies might shed just once, and others (particularly in warmer climates) will shed constantly through the year. Shedding can take anywhere from two to six weeks, typically somewhere in the middle. During this time you will find yourself constantly vacuuming up the hair and fluff around the house. Many Siberian Husky owners suggest investing in a good vacuum such as a Dyson Vacuum to make the job easier. Your Siberian Husky Puppy will start shedding coat early on, from when you bring it home from the breeder, around 8 weeks of age. However this might just be the odd hair. When the Husky is a bit older, around 6 months, you might experience the first coat blowing. Of course the larger the dog gets, the more coat it has, and more of a problem this will get. Use the time early on to get the Husky used to being groomed. Even if the coat isn’t shedding, you can still practice combing your puppy and having it get used to the feeling of stroking it and pulling a comb through it’s fur. You might want to start off with a softer brush, and groom for short periods of time (5 minutes here or there). Have the puppy stand for you while you groom, and reward with little food treats to help encourage this behavior. Once the puppy is used to the sensation of a soft comb you might want to upgrade to one that is specially designed to extract dead hair. The “Furminator” is a very popular choice that is effective and lasts a long time, making it cost effective. However there are many brushes around and you can get advice at your local pet store if unsure. Check out our guide on the best brushes for huskies for more info. Nobody ever suggested owning a Husky would be easy! Grooming is one of the necessary jobs you need to do along with exercising and playing. 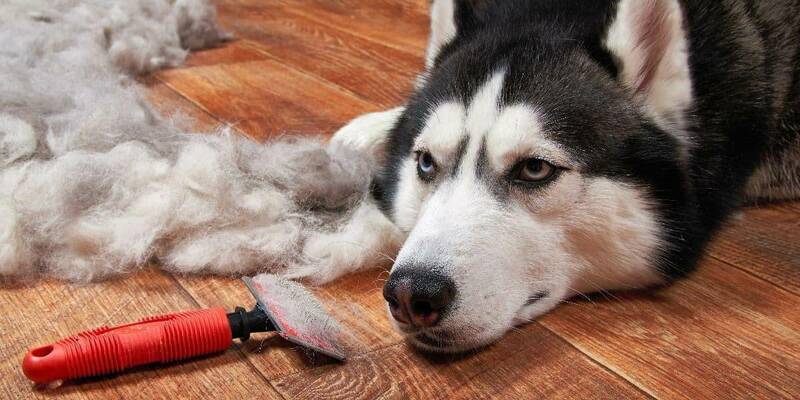 Shaving your Husky is a very big “no no”, no matter how warm your climate is. A Husky’s coat actually helps block out harmful sun rays and helps regulate the dog’s temperature. If you shave the coat off your Husky is likely to overheat or get cold very quickly, not to mention look ridiculous! You can call in a professional dog groomer to help, but the reality is you can’t have them present 24 hours a day. You will just need to accept the build up of fur around home and try to deal with it the best you can. Owners of smaller Husky dogs such as Minis and the Alaskan Klee Kai suggest the problem is more manageable because of the smaller dog size. Owning a Husky comes with special responsibilities in the grooming department. Enjoy a positive attitude that after all the playful mess that your dog will leave during shedding season, you will have a very clean and good looking dog for another 6 months!